While MoB are best known for their song “That’s When I Reach For My Revolver”, it was someone else version of that song that finally exposed the band to a larger audience. Moby version of that song (and a video) became an MTV staple in the mid 90s (long after the band went on indefinite hiatus), although Moby had to change song title in order to make it safe for MTV play (which caused some outrage among rock fans). R.E.M. also did a cover of “Academy Fight Song”, although it never appeared on any of their official releases. Formed in Boston, MA in 1979, the band consisted of Roger Miller, Clint Conley, Peter Prescott and Martin Swope. Musically, they were as intense as any punk band, but they were also able to separate themselves from regular three chord crowd through their use of unusual time signatures and chord progressions, as well as tape effects (courtesy of Martin Swope). Before Mission of Burma, Roger Miller and Clint Conley were playing in Moving Parts, another Boston band that also included future members of Birdsongs Of The Mezozoic. Although extremely short-lived, Moving Parts produced a number of songs, including “Max Ernst”, a song that became one of the most recognizable tracks in MoB back catalogue. After Moving Parts dissolution, Miller and Conley wanted to pursue a harder sound and they started practicing in the late 1978 and they also began auditioning drummers, by playing Sun Ra and James Brown for them, until the applicant left. Finally, they hired Peter Prescott (Molls), a big fan of Moving Parts. Clint Conley came up with a name “Mission of Burma” after he saw a plaque on New York City diplomatic building that Conley once saw. According to him, the phrase had “a murky and disturbing quality” – a great way to describe Mission of Burma sound. MoB debuted in 1979 and the first song that they wrote was “Nu Disco”, which, as Miller felt, could soon better with tape loop. He contacted Martin Swope, who was a tape manipulator, inspired by the likes of Stockhausen and Cage. Soon, Swope joined the band as a sound engineer and tape-effect artist. By 1981, they signed a deal with Ace Of Hearts, Boston label run by Rick Harte and debuted with “Academy Fight Song / Max Ernst” single. Although initially the band objected the release of single (since they felt it doesn’t come close to their live perfromances), it still sold out very quickly and both songs became fan favorites since. Their EP “Signals, Calls And Marches” sold out its initial pressing of 10,000 copies very fast, as well. Later on, it was reissued by Rykodisc (with six remastered original songs and two bonus tracks – both from their first single) and Matador (with video material and even more bonus tracks). Their first (and final, before reformation) full-length VS is generally considered to be one of their best works, as well as one of the best albums of the 80s. According to Eddie Vedder, Pearl Jam’s “VS” was a tribute to MoB album. Rykodisc reissued the album in 1997, with four bonus tracks. Despite all of their victories, Mission of Burma broke up in 1983, partly because Miller started to suffer the effects of live shows and he had to wear earplugs while on stage. They did a farewell tour and a post-humous live album “The Horrible Truth About Burma” came out on Ace Of Hearts in 1985. After MoB breakup, band members went on to play with a number of other bands – Miller and Swope were in Birdsongs Of The Mezozoic (although both of them left the band eventuall), while Prescott played with Volcano Suns, Kustomized and Peer Group. Conley dropped out of music business, but returned with his band Consonant, which also includes members of Bedhead and Codeine. Following their demise, they popularity grew enormously and the band was cited as an influence by countless bands, including Nirvana, Superchunk, Jawbox, R.E.M., Grifters, Sonic Youth, Drive Like Jehu, Sugar, Catherine Wheel, Pixies and many others. New millenium, however, brought something bigger than side projects and new bands – a full-on Mission of Burma reunion. Swope was replaced with Bob Weston (Shellac) and he used both tape deck and sampler during band’s live performances to emulate what Swope did before him. With their reunion, MoB attracted even bigger crowds than during their original run and they also received plenty of praise for two new studio albums that they produced since reformation – 2004 “OnoffON” and its follow-up – 2006 “Obliterati” (both of which came out on Matador). Matador also put out remastered versions of “Signals, Calls And Marches” and “The Horrible Truth About Burma”. 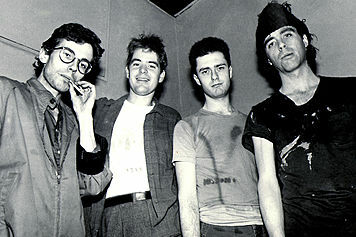 2006 saw a release of “This Is Not A Photograph” – documentary, which chronicles Mission of Burma career, from their breakup in the 80s to reunion. It features interviews with band members themselves, as well as interviews with the likes of Moby, Mike Watt and Cheap Trick’s Robin Zander.